At the start to every season, each of us tries to pick which team will be the last standing the following June. The NHL has some teams we know will be in the mix at the end, but it's always unpredictable how it will shake out, and each season we see something we haven't seen before. Each time we try to predict who will win the Stanley Cup, it becomes more and more clear that none of us really know how the season will unfold. Of course, that doesn't mean we don't try. If there's one thing that is clear as the 2014-15 NHL season begins, it's that there are some contenders in the East and some serious depth in the West. It's easy to say the Western Conference will have more contenders, and it is true that you can't go into a slump in the West or you'll be too far behind. Some very good teams will be on the outside looking in when the Stanley Cup Playoffs begin next spring. But the Eastern Conference will be extremely competitive too for the exact same reason. The West may have more depth than the East, but those teams are still tightly bunched and evenly matched. Just as in the West, you can't afford to have a slump in the East or you might miss your chance at making a Cup run. It will be tense all season long, and the postseason field could come down to an injury or some bad luck here or there, but when it's all said and done, this is how I see it shaking out. The amazing thing about the Eastern Conference is that it's so wide open. There aren't many picks that seem too off the map just because the conference seems so even and tough to predict throughout. In the Atlantic, though, it still seems clear to me that the Boston Bruins are the best team in the division, and probably the conference. The Tampa Bay Lightning are right there with them, with solid goaltending, defense and one of the best offensive players in the game in Steven Stamkos, but I just don't see Tampa Bay beating Boston out with its experience and its talent. Even after trading Johnny Boychuk this week, the Bruins have two great lines, great goaltending and a real solid defense. It'll be tough for the Lightning to top that. This division is a microcosm of the entire conference's unpredictability. The defending conference champions are here, but honestly, I wouldn't be surprised to see the New York Rangers miss the playoffs. A few big pieces like Brian Boyle, Benoit Pouliot and Brad Richards are gone now. Add to those losses that the New York Islanders got significantly better this week, the New Jersey Devils will have more offense and perhaps more stability in net than they did a year ago, and the Pittsburgh Penguins and Sidney Crosby are still there. That said, I think it's still the Rangers. I love their defense, it's one of the best in the NHL, and you've got the goaltender. Henrik Lundqvist has proven that he plays 70 games a season, he stays healthy and he keeps you in almost every game. The Rangers are solid throughout the lineup, but Lundqvist, I think, is the guy who makes the difference. It's the Western Conference getting all the ink this preseason, and there are good reasons why. Several teams from the Pacific or Central could win it all next June and no one would be shocked. The Central, in particular, should be extremely competitive. I love what the Dallas Stars did bringing in Jason Spezza to a team that already impressed in its return to the postseason last spring. The St. Louis Blues will still be there and be even deeper with the addition of Paul Stastny, even if there might be some questions in goal. 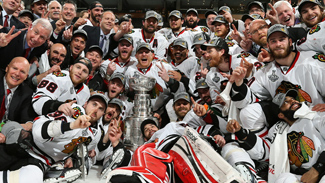 Still, I think it's hard not to take the Chicago Blackhawks to win this division. They're so talented and so deep that I have a lot of difficulty seeing one of the other teams being better over 82 games. It's pretty amazing when you look at a group of teams that includes a winner of two of the past three Stanley Cup championships and think they may not even be the best one here, but this season that's what I see. The Los Angeles Kings will be in the mix, no doubt, and the San Jose Sharks will likely make the playoffs, but I think the Anaheim Ducks will win the Pacific. They finished one point behind Boston in the race to win the Presidents' Trophy last season, then added Ryan Kesler, who puts them over the top for me. I also think John Gibson is the real deal in net, and Fredrik Andersen will give them solid goaltending too. Dany Heatley is also an interesting addition. Although his days of scoring 40 goals are probably gone, he should still take a run at 30 if he has elite guys like Ryan Getzlaf and Corey Perry playing alongside him. Even if he plays on a line with Kesler, he is still with one of the elite centers in the NHL. I think the Ducks will take the Pacific away from those other great teams out there. When you look at the Eastern Conference, it's possible that we'll get a team that surprises us and takes the conference title. The Rangers did it last season and the Devils did it two seasons earlier. However, I'm still going to be very noncontroversial. I think Boston is the best team in the conference, and although they might be fading and their best years may be behind them, I still think the Bruins will get the job done. In the West, I see the Blackhawks. I look at that lineup, the depth, the young players like Andrew Shaw and Ben Smith who are starting to be more and more of a factor, their defense which is still so strong with Duncan Keith and Brent Seabrook, and the forwards in Chicago might be the best group in the League. This team could have gone to the Cup Final last spring, and they have the talent and leadership to get back and take care of business once more. As for when the two conference champs meet, well, I just don't see an Eastern team that can beat a Western team in seven games. The depth and talent in the West, the speed of the game and the way those teams play, it's just much deeper all around. I think regardless of which team wins the Western Conference, that team will win the Stanley Cup. I think the Chicago Blackhawks will be that team.